» home » magazine » 2016 » november 2016 » do you place a dollar value on downtime? 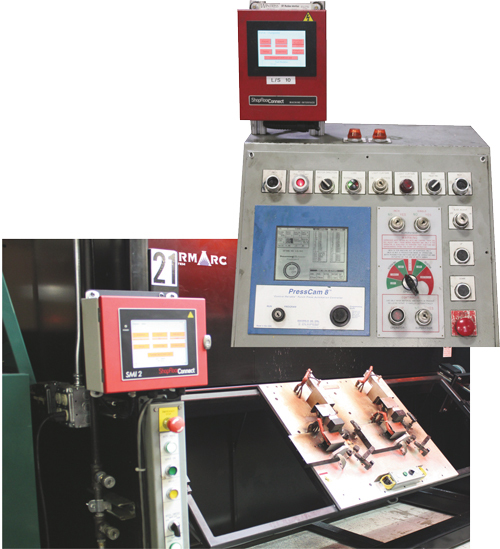 ODM has installed ShopFloorConnect data-collection devices on 10 of its presses (top) and on its four robotic-welding cells, providing detailed downtime-runtime analysis to help the metalformer optimize OEE. Data analysis has led to continuous-improvement projects focused on activities such as quick die change and development of ergonomic weld fixtures. Any number of ailments and wounds can impact metalforming-shop performance—unusually slow die changeovers, untimely and overly time-consuming press or die repairs, and unexplained and inconvenient expediting of materials are just a few. Shop management can either take a quick and easy Band-Aid approach to healing these wounds and watch them reappear, or focus on root-cause analysis and cure them forever. 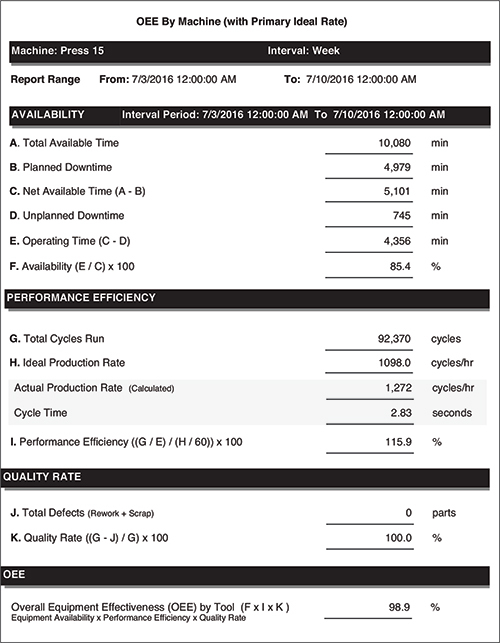 At Chicagoland metalformer ODM Tool & Mfg., Inc., a focus on root-cause analysis and a more permanent approach to ensuring optimum shop performance has led to a significant boost in overall equipment effectiveness (OEE), and a corresponding drop in downtime. Several factors contribute, such as better use of predictive and preventive maintenance, and closer policing of activities—die changeovers on presses and cycle times through robotic-welding cells, for example. All of these activities have one common thread: real-time gathering of production data, and visibility of that data by management to enable quick and decisive action. It’s a terrific example of Industry 4.0 connectivity impacting the metalforming industry. If you’re not operating as a ‘smart shop’ today, and lack plans to become one, you’re likely a ‘dumb shop,’ or on your way to becoming one. And I have no doubt that the smartest metalforming shops will likely be those that survive the next industry downturn, whenever that occurs. 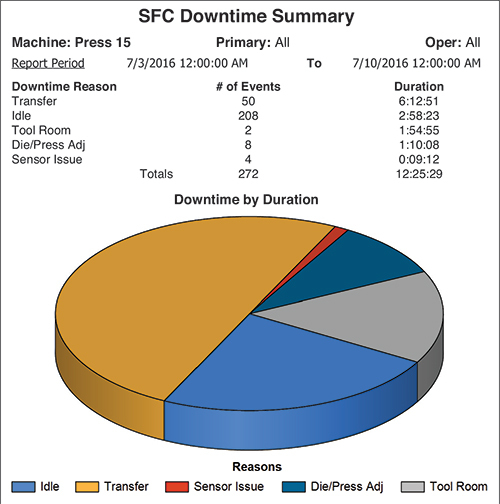 Examples of the type of data ODM managers receive from ShopFloorConnect—daily and weekly downtime-runtime summaries. ShopFloorConnect employs data-collection technology able to be installed at any machine in the factory, and uses electrical signals from the machines to monitor runtime and parts counts. By inhibiting a machine from operating until the operator has entered a downtime code/reason, managers gain a clear picture of exactly what’s happening at each machine. And, as noted by Michaelsen, when operators know that management is keeping a close tab on operations, the shop tends to run much more effectively. ShopFloorConnect also features an alert feature that sends e-mails or text messages when downtime exceeds what is expected for each machine activity—die changeovers or weld-fixture load/ unload, for example. Do your shopfloor managers know if the same job runs at the same hit rate every time? Do they know if a value-added assembly job runs at the same cycle time for every lot? And, even if they do know where process inconsistencies lie, do they have any data-based and supported methodology for understanding why the processes fail to run at consistently high levels of efficiency? 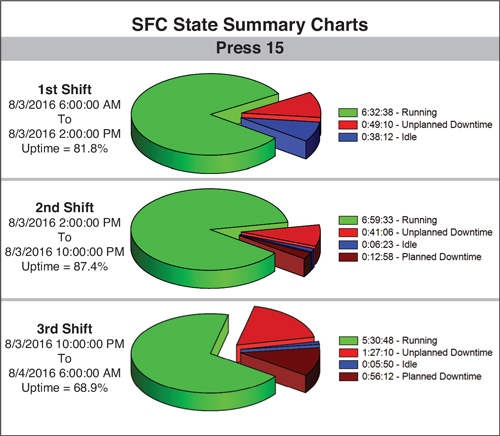 Unless you’ve equipped the shop with data-tracking and online analysis tools, chances are that any efforts to fine-tune efficiency are stabs in the dark without much data to support those critical decisions. And, often those attempts are made after the fact, when productivity already has suffered and the impact is felt throughout the plant. OEE reports, by machine, help identify continuous-improvement opportunities, to unearth hidden press time and allow ODM to bring in more work without adding new capital equipment. “We prefer to fine-tune our processes and react early to prevent big problems late in a run,” says ODM production manager Brandon Enright. Asked to identify continuous-improvement projects spurred by its recent data-gathering and analysis efforts, Enright points to a plague common to many metalforming shops: maintenance-related downtime. One more example: tracking cycle time through the robotic-welding cells, and identifying inconsistencies that can be tracked back to flawed procedures. “By knowing immediately if a cell’s throughput is slipping,” Enright says, “we can troubleshoot before things spiral out of control. For example, we’ve identified wear parts on the robots that can inhibit performance, so that we can replace them in a timely manner. And, we’ve identified processes where the robotic welder works more quickly than the operator tasked with loading and unloading the weld fixtures, causing robot idle time. Again, we assign a dollar value to downtime. In these cases, we might redesign the fixture or provide the operator with special tools to allow him to load/unload more quickly, or look to make his process more ergonomic.